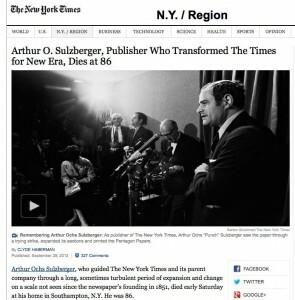 With the recent pass­ing of Arthur Ochs Sulzberg­er, the for­mer pub­lish­er of The New York Times (NYT) and Chair­man and CEO of The New York Times Co., much is being said about the trans­for­ma­tive years of expan­sion and change under his 34-year tenure. His obit­u­ary talks about his reign from “the era of the hot lead and Lino­type machine to the birth of the dig­i­tal world” and how, under his lead­er­ship, the com­pa­ny became a diver­si­fied media oper­a­tion that includ­ed news­pa­pers, mag­a­zines, television/radio sta­tions and online ven­tures. Of par­tic­u­lar note was his appar­ent will­ing­ness to invest, in expand­ing the num­ber of sec­tions in the news­pa­per as well as into oth­er areas, when most oth­ers were not so will­ing. Richard L. Gelb, a long-time mem­ber of the Times board, said in 1997, “Adolph Ochs is remem­bered as the one who found­ed this great enter­prise, and Arthur Ochs Sulzberg­er will be remem­bered as the one who secured it, renewed it and lift­ed it to ever-high­er lev­els of achieve­ment.” It is my expe­ri­ence that this vision­ary “way of think­ing” about the respon­si­bil­i­ties of lead­er­ship may be a dis­tin­guish­ing fea­ture of many fam­i­ly-influ­enced com­pa­nies. Over my career, I have spent con­sid­er­able time look­ing into the entre­pre­neur­ial dimen­sions of such com­pa­nies — even co-author­ing a jour­nal arti­cle that ruf­fled more than a few feath­ers among tra­di­tion­al­ists in this field. The arti­cle explored how an enter­pris­ing fam­i­ly would move beyond an exclu­sive focus on the sus­tain­abil­i­ty of any giv­en set of oper­at­ing assets to cre­ate wealth for future gen­er­a­tions, or what we called “trans­gen­er­a­tional weath cre­ation”. Say a fam­i­ly is in the shoe­mak­ing busi­ness. If they are enter­pris­ing, they will keep that oper­a­tion run­ning (if it’s sus­tain­able) while explor­ing new oppor­tu­ni­ties. By con­trast, oth­er fam­i­lies will focus only on the shoe­mak­ing busi­ness, to the detri­ment of future ven­tures. Not so an enter­pris­ing fam­i­ly who views cur­rent assets as a plat­form to stand on while con­stant­ly seek­ing new sources of wealth cre­ation in per­pe­tu­ity. Back to Sulzberg­er: he made sure that the NYT oper­at­ing assets were used, in part, to main­tain a vibrant and inde­pen­dent jour­nal­is­tic voice by not hun­ker­ing down on man­ag­ing news­pa­pers and news­pa­pers alone. Do typ­i­cal CEOs have a sim­i­lar stew­ard­ship view when lead­ing their organ­i­sa­tions? Some CEOs, sure. But in far too many cas­es a larg­er pur­pose — one that extends beyond short-term earn­ings per­for­mance and stock mar­ket val­u­a­tions– is seri­ous­ly lack­ing. Shake hands with a CEO who is 100% about meet­ing month­ly or quar­ter­ly goals while post­ing hefty div­i­dends, and you will prob­a­bly be in the pres­ence of some­one who nev­er will under­stand or appre­ci­ate all the praise of Arthur Ochs Sulzberg­er on his pass­ing. The for­mer is myopic; the lat­ter was a leader.